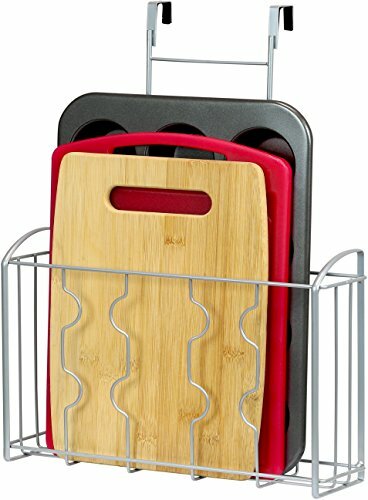 SimpleHouseware Over Cabinet Door Cutting Board Bakeware Organizer, Silver makes you organize your kitchen easily and simple. The over-the-cabinet installation allows you access your bakeware like muffin pan, cup cake pan and cutting board quick and convenient. Installation (Just hook this on any of cabinet door inside or outside) is easy and varied. Either over-the-cabinet door hooking, mounting on cabinet door (screws included) or mounting on drywall( screws and anchor included).